On the Liberte, you can enjoy your pre-wedding celebration on the water in style. What better way to celebrate a bachelor or bachelorette party than with a sailing celebration? Although a night out on the town may be fun, why not offer a unique experience for your next occasion? On the Liberte, you can enjoy your pre-wedding celebration on the water in style. As you sail along the beautiful views of Cape Cod, you and your friends will be able to enjoy the afternoon with drinks, snacks, and all the fun of going out in a private party on the bay. If you are in the process of planning one of these exciting pre-wedding celebrations, consider a sailing party that is perfect for your occasion. 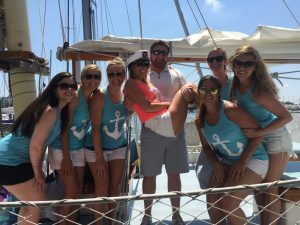 While partying in a bar downtown may be a fun night out for any occasion throughout the year, a sailing party is an exciting and unique way to have fun with your girls on your big night out. Our full beverage bar is stocked and ready to go for your party, and unlike a bar or nightclub, your celebration is a private event for you and your friends on board. Bring fun games, your favorite music, and great food along for your afternoon to enjoy the fun of your bachelorette party alongside the beautiful backdrop of Cape Cod. Take your bachelor party to the seas with a cigar celebration! Start your night out with the boys aboard the Liberte with our Cigar Party Charters, the only schooner that permits smoking. As you sail along Cape Cod with your party, you and your groomsmen can enjoy a private party of great drinks, music, and cigars before hitting the town for a night of fun. With June just around the corner, now is the perfect time to plan your sailing party for your pre-wedding celebration. The Liberte is available in Annapolis through June and then in Cape Cod from June 30th through September 3rd. As you sail with us, you will enjoy beautiful views aboard the Liberte with your closest friends by your side, and kick off your summer with an unforgettable celebration. Enjoy Your Celebration in Cape Cod with a Sailing Party on the Liberté! This entry was posted on Friday, May 25th, 2018 at 2:34 pm. Both comments and pings are currently closed.